Patrick J: That captures it pretty well. Pek was a big concern early in the season, looking like he was either out of shape from not playing or working out in the offseason much whilst he waited for his contract situation to be resolved, or out of sync with the system Rick Adelman had implemented and the larger roles of Kevin Love and especially newcomer Kevin Martin. Before the season, I predicted that Pekovic would struggle offensively this season because he would be a third wheel instead of a second option, like he was last season. The first handful of games the Wolves played seemed to bear this out, with Pek struggling to find his role in the offense, failing to score the 16 points he averaged per game in 2012-13 in any of the team’s first seven games. His season scoring average is down right now from 16.3 to 13.9, despite the fact that the Wolves’ pace is up from 95.2 in 2012-13 to a league-leading 102.1 so far this season. But more importantly, after his initial struggles, Pek is on an upward trend, averaging 17.5 in his last four games. And even more important than that, he looks more sure of himself in where to be on the floor in order to generate scoring opportunities for himself and appears to be hitting the boards more aggressively, as we saw last night, when he had eight offensive rebounds and looked like an absolute beast in accumulating them. Pek’s emergence is making me more confident about this team’s prospects than I was even just one week ago. We’ve seen the struggles they have when Love and/or Martin aren’t hitting. They just don’t have the offensive depth to win most of those games without Pek as a credible third option. Now that he appears to be just that–i.e., he’s playing like his old self again–the Wolves should lose fewer games even when the core of their core isn’t at its very best. Patrick J: Derrick Williams (and Alexey Shved) are reportedly on the trading block. No surprises here. Neither player is currently in Rick Adelman’s regular rotation, nor does either look like he’ll be able to adapt his game to fit into it. Given how well the regular pieces are gelling in Adelman’s system and the rotation that has been set so far, it makes a lot of sense to explore trades for Williams and Shved. The key question is what, if anything, the Wolves could garner for these two flawed talents. Here are a few teams that could be potential targets. The best-case scenario is probably Philadelphia’s Evan Turner. Turner would give the Wolves a veteran SG/SF combo and some depth behind Kevin Martin and Corey Brewer. That would help a lot, especially until Chase Budinger is healthy again. But Turner’s breakout season thus far–on a division-leading 76ers squad that is now without the injured RoY candidate MICHAEL CARTER-WILLIAMS (! ), probably means both (1) his value has gone up beyond Williams and Shved, and (2) Philadelphia might be less willing to cut bait on Turner than they thought they’d be going into the season. The Wiz would like to get rid of Jan Veseley (! ), whom Wolves POBO Flip Saunders apparently liked when Jan was drafted (at the time, Flip was on the Wizards’ payroll), and whom he might believe is salvageable. The article doesn’t indicate who would come back to the Timberwolves, but methinks it would probably have to include Trevor Ariza. Personally, I’d consider the deal, but would be reluctant to take on Veseley unless the ‘Zards can serve as a guarantor that Jan’s girlfriend also comes to Minnesota. Kyle Lee Lowry and Steve Novak for Williams and Shved. This is a rumor I’ve seen bandied about in comments sections. Andy G: The team could use one more wing until Budinger gets back and one more big until either Ronny gets back or Gorgui learns how to defend without fouling. And I’m sure they’d love to get something — anything — of value for Williams and Shved. Each player is on the books for another season and if nothing else they’d probably rather have cap relief next summer than either of these guys warming seats on the end of Adelman’s bench. I agree that Turner is, or should be anyway, way out of the Shved & Williams price range. He’s posting better than 21/6/3 right now on a team that isn’t (so far, anyway) terrible. Neither Shved nor Williams could put up those numb#rs in any NBA situation. Unfortunately, I think your other proposals are too optimistic as well. Ariza is logging 35 minutes a game for the Wizards, making 40 percent of his 3s, and, well, I think their next logical move is to fire Randy Wittman (a tried and true method for instant improvement) rather than further shaking up their roster after the recent trade for Marcin Gortat. Washington is trying to make the playoffs and Derrick Williams doesn’t help them reach that goal. Personally, I just don’t think either TWolf on the block has any trade value, and it’s a difficult time of year to execute these kinds of deals. I’m sure Williams’ agent wants his guy moved ASAP though, so we’ll have to wait and see. The Wolves have a much needed day off today and will practice at home tomorrow. Adelman seemed excited about getting to practice, which is why he is Rick Adelman. Then it’s on the road to Washington (Tuesday) and back here to host the Clippers (Wednesday). 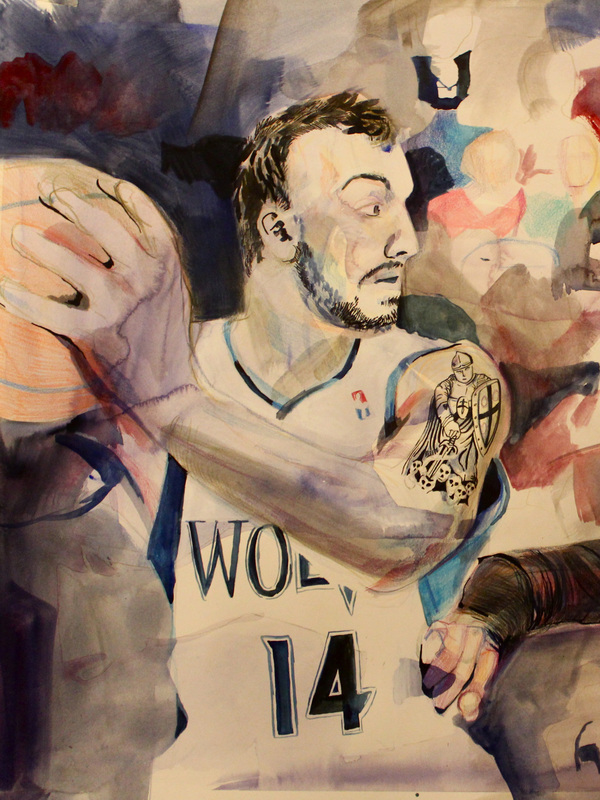 Good job as always by you guys, but that fantastic Pek painting steals the show. Terrific. I’m sending everyone from Canis over to see it.